Results showed that the mean adhesion score difference between Twirla® and Xulane® was -0.25 with the upper bound of the 95% confidence limit for the mean difference of -0.16. 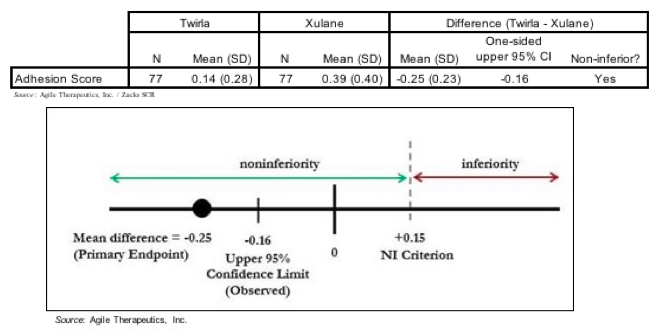 Following discussion with the FDA in December 2018, it was decided that Twirla® would be considered statistically non-inferior to Xulane® if the upper 95% confidence limit of the mean difference was less than +0.15, thus Twirla® met the definition of non-inferiority. The negative value for the difference in mean adhesion score indicates that the mean score for Xulane® was higher than the mean score for Twirla®. The results are summarized below. The company will now turn its full attention to getting the New Drug Application (NDA) resubmitted, which we expect to be completed during the first half of 2019. We anticipate an Advisory Committee (“AdComm”) taking place to discuss the Pearl Index values from the Phase 3 trial. In addition, we anticipate an inspection of the third-party manufacturer’s facility taking place prior to approval. If the NDA is submitted in the first half of 2019, with a six-month review period Twirla® could be approved before the end of 2019. We are glad to see that the adhesion study for Twirla® was a success and the company can now fully focus on getting the NDA resubmitted before the end of the first half of 2019. We currently estimate that the company has sufficient capital to fund operations through the second quarter of 2019, but will require additional capital to fund operations beyond that, including any pre-commercialization activities and the commercial launch of Twirla®, if approved. Based on the successful results of the adhesion study we have slightly increased the probability of approval for Twirla®, which has increased our valuation to $3.00.